This is not the first time we talk about the smartphone Samsung Galaxy X, a device equipped with foldable display. A folding screen that Samsung has been patenting with different variations of the same concept, but has never come to apply directly on a smartphone or a tablet. 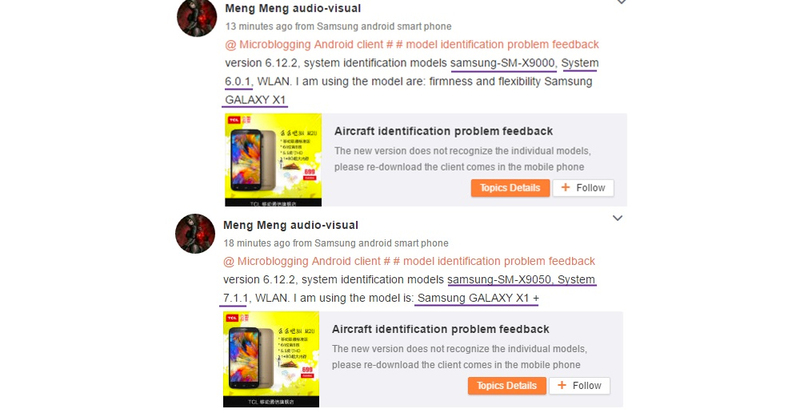 Well, a new leak comes from the social network Weibo -a true mine of rumors and leaks for several years- and ensures that there are actually two models of Galaxy X, which would actually be called Galaxy X1. At its side we would find the Samsung Galaxy X1 Plus, a model that could be equipped with a larger foldable screen. The codes for each model would be SM-X9000 for the Galaxy X1 and SM-X9050 for the X1 Plus variant. In addition, thanks to a screenshot that also appears in Weibo, we see that the first smartphone would incorporate Android 6.0 Marshmallow, while the second smartphone would have Android 7.0 Nougat. Galaxy X leaked on January 9 as Galaxy X1 and X1 Plus, are associated with the start of a testing phase of both foldable Samsung smartphones in China. Since the Weibo website is of Chinese origin, and it is where this leak has been shared, we can expect some reliability in all these novelties. For more than a year we have talked about the possible launch of a Samsung smartphone badge with a folding screen. The code name was Project Valley, and on it have been arising different patents granted to Samsung by technologies of folding for mobile devices. The most recent patent application, dating from the beginning of November 2016, shows an elongate device, which can be folded over itself to occupy a size equal to half its length. The idea is to close it to facilitate transport in a pocket or bag, and open it as a wallet when the user wants to use the full screen. The hinge, in this case, resembles Microsoft's Surface Book notebook. And remember, you can check out our top with the smartphones with best screens to buy today.